Your home’s entry doors are a crucial part to the building envelope. A building envelope is a physical separation between the inside of your home and the outside world. It’s your home’s defense against weather and energy loss. When it comes to energy efficiency and keeping your home warm in the winter and cool in the summer, what you’re really thinking about is your home’s building envelope. Storm doors help protect the entry door from weathering and damage while insulating your home and keeping it secure. These doors are made to close automatically, but most will have a locking mechanism to keep the door ajar. Storm doors can have a full pane of glass or just half of the unit can be made of glass. There are several advantages, as well as types of storm doors for your home. Storm doors are assets that homeowners don’t see the value of or don’t understand their benefits until it’s too late. Storm doors have a the capability of allowing heat and light in from the sun, all while keeping the cold out of your home. This extra barrier from the elements is the main reason why storm doors are energy efficient. In the cold, a vapor barrier is created between your entry door and storm door where the air is warmer than outside, keeping your entry door temperature up, transferring less cold inside. In the summer months, they’re extremely more energy efficient by sending cool breezes through your home via screens in the doors than running the air conditioner on high all day. 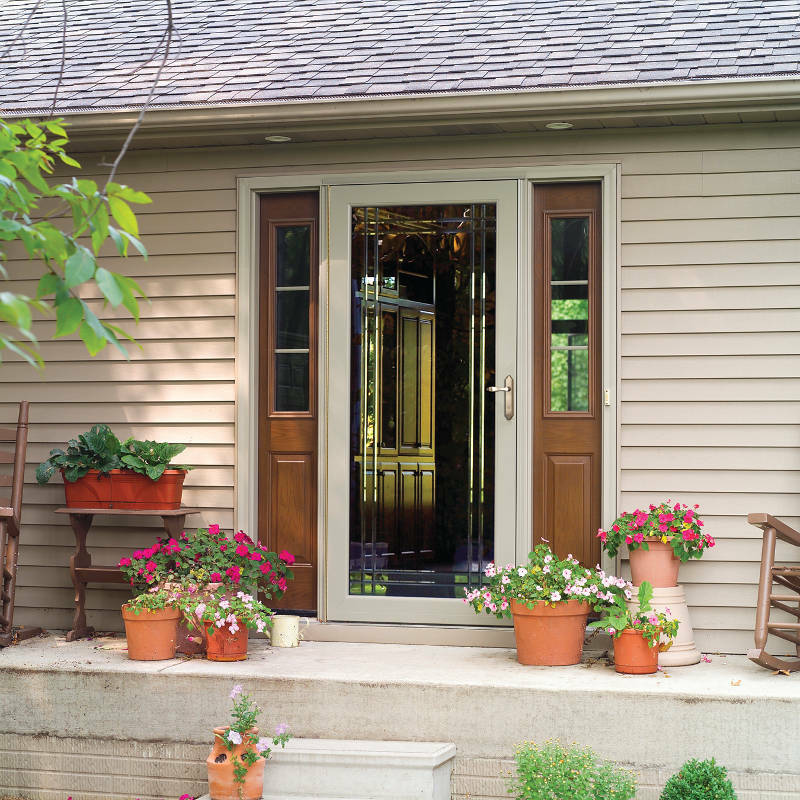 Storm doors provide safety from intruders, pets, children and insects. The extra layer of protection helps keep what needs to be outside out and what needs to stay inside in! Storm doors with metal mesh screens provide the upmost safety by utilizing heavy duty, durable, fixed stainless-steel screens that don’t pull from the framing. This keeps eager kids and pets guarded. Double and triple sealed bottom sweeps are also the best protection to keep insects and other crawling creatures out of your home. There are professional-class storm doors that are produced using 20-percent thicker aluminum than consumer-grade storm doors. This helps make your home even more energy efficient, creating an air tight seal so no drafts can get into your home. Storm doors aren’t usually considered a design statement on the exterior of a home. In fact, for years, they’ve taken away from the beauty of the entry door. However, designers now are changing how storm doors appear. You can customize your storm door to meet your unique configuration of your entryway. Choose the style, paint finish, hardware, glass and accessories to create a beautiful and stunning masterpiece. Full view storm doors feature a full glass design that lets in the light and shows off your home’s entry. This style of door offers the widest variety of customization with choices of frame color, glass and handle options. Most full glass models come with an interchangeable screen for seasonal ventilation. You can also get a retractable screen system that allows the screen to roll up and store in the top and bottom rails of the door. If you have a lot of traffic coming in and out of your home but want to enjoy the natural sunlight, a mid-view door is your best option. The design lets you increase light in your entry, but also has a bottom panel that adds durability for heavy foot traffic. These doors offer traditional ventilation and retractable screens. High view storm doors have the traditional look featuring glass and screen on the top half of the door. With the largest panel option, high view doors are designed to stand up to heavy foot traffic. This type of storm door is perfect for backdoors and entryways where a lots of traffic comes through swinging the doors open. These doors also feature traditional on-demand ventilation where you lift the glass up to enjoy the breeze. The frames and glass of storm doors can come in many different styles, all which let in different levels of light. Full view storm doors have an entire panel of glass in the door, mid-view storm doors are comprised of three-quarters glass, and high view storm doors have glass in the upper half. Glass can be clear, decorative, or Low E. If you need a storm door customized to a style that matches the exterior of your home, they’re available in a variety of colors and handle sets are available in many different finishes. There are also several extras you can add to make your storm door more beautiful and functional. You can choose a built-in keyed lock or any type of lock desired. Handles and hinges can be found in a variety of finishes like oil rubbed bronze or antique brass, or you can choose to have them match the color of the door. How do you recognize a quality storm door? First, feel the door, and feel how it opens and closes. A quality door will have more heft, it’ll close more smoothly, and you’ll see the quality of construction. The corners and moldings will be tight and finished looking. If you know the brand of the exterior door in your home, check to see if the manufacturer also provides a door kit for storms and screens. This is an especially good idea if you have a sliding or French door. The kit will match the design of the door and will fit properly over the threshold. Whether you’re interested in protection from weather, extending the life of your entry door, or amping up your home’s security, a high-quality storm door can make a huge difference for your home. 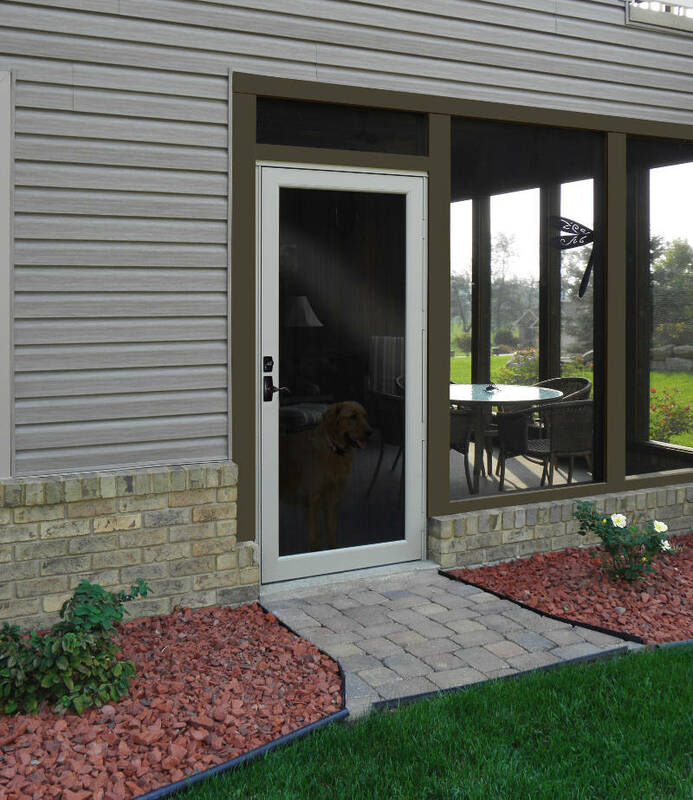 Feldco offers high quality, aluminum storm doors to the residents of the Quad Cities. We’ve been serving Midwest homeowners for over 40 years and in that time have helped over 350,000 homeowners with their home improvement projects. What are you waiting for – join those happy homeowners who have trusted Feldco and get a free quote now.